A twelve (12) ship Heritage Flight of CH-46 Sea Knights (or "Phrog's" as they are better known) from USMC HMM-364 World Famous Purple Foxes will fly today from MCAS Camp Pendleton (NFG) South along I15 to MCAS Miramar, across to the ocean then down to San Diego Bay and back up the coast. This Helicopter began US Marine Corps and US Navy service in Vietnam. CH-46's are being replaced by MV-22 Ospreys over the last few years and Phrog Squadrons designated "HMM"'s for Helicopter Marine Medium are now becoming "VMM"'s for "Vertical/Short Take off and landing (V/STOL) Medium Marine" Squadron. Only two HMM squadrons remain: HMM-364 Purple Foxes, due to transition to Ospreys this year, and HMMT-164, the last squadron to have CH-46's that will transition next year. 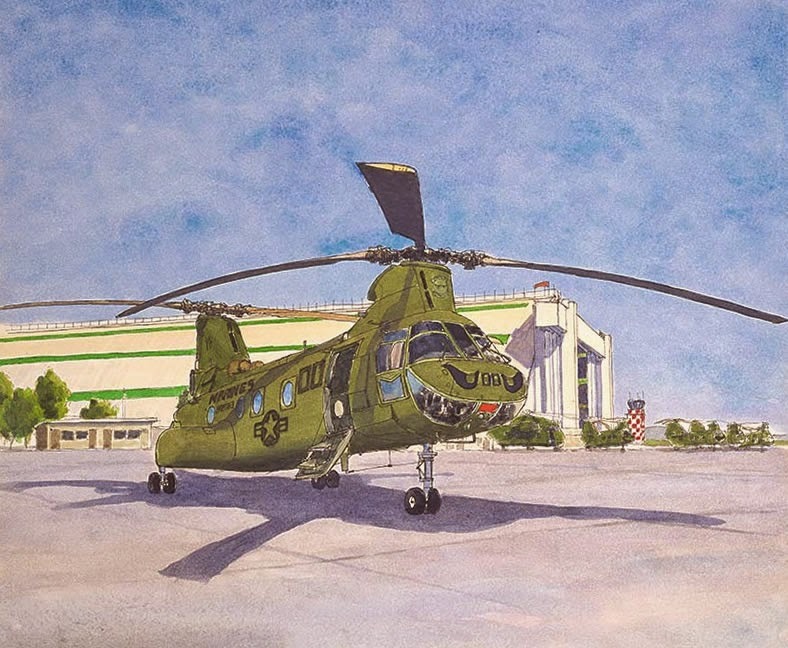 Paul grew up in the flight path of MCAS Tustin (then MCAF) and watched as the CH-35 Choctaw's were slowly replaced by the CH-46's and drew both as a child. This led to doing paintings of aircraft for Marines personally, to paintings of the MCAS Tustin Blimp Hangars, and to support of their Open Houses and the MCAS El Toro, MCAS New River, MCAS Cherry Point and MCAS Miramar Air Shows that continues to this day.